Schedule is the easiest way to resource your team. It’s designed to be simple, fast and communicative. The app interface is lightweight with neat features to make the act of scheduling easy. It then sends out email reminders to resources and managers detailing their tasks and the forthcoming plan. 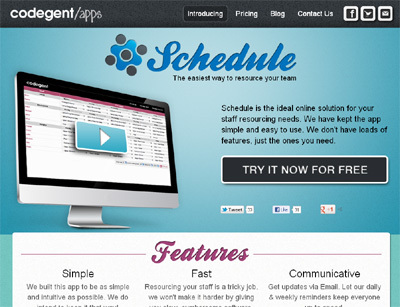 We are a digital agency based in the UK and one of our biggest headaches is resource scheduling. We tried a few pieces of software out but we generally found them to be cumbersome to use, expensive or overly complex. For 6 months we even ran off a Google Doc! Eventually we just built our own internal system and, as we had become experts in the problem, we built something pretty cool. We have since decided to share this with the rest of the world and just came out of a really constructive beta period.